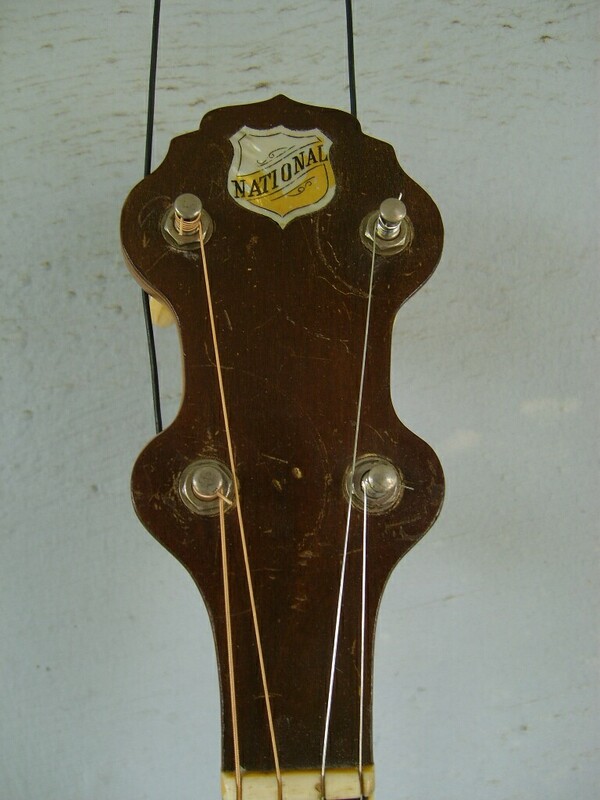 A word about old Nationals. I'm proud to announce that in conjunction with Colin McCubbin's notecannons collection I will be offering for sale a variety of the more exotic resonator instruments from that collection over the next few months, as well a some of my own instruments. 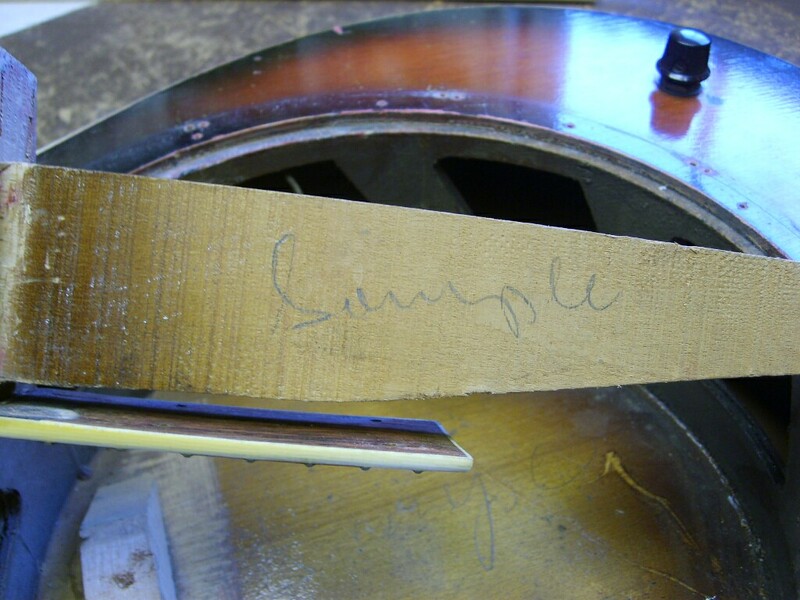 All the instruments I sell will have been carefully checked over by me and I will have done any repairs or setups that they require to put them into first class playing condition. 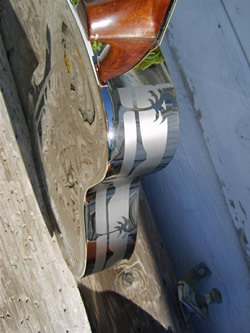 Instruments I have recently completed include two single cone Nationals, a Duolian and a Triolian, both are in excellent condition, the Duolian is as mint as I have seen in a very long time! I recently completed set up on a Style 1 tricone guitar and a style 1 tricone tenor. 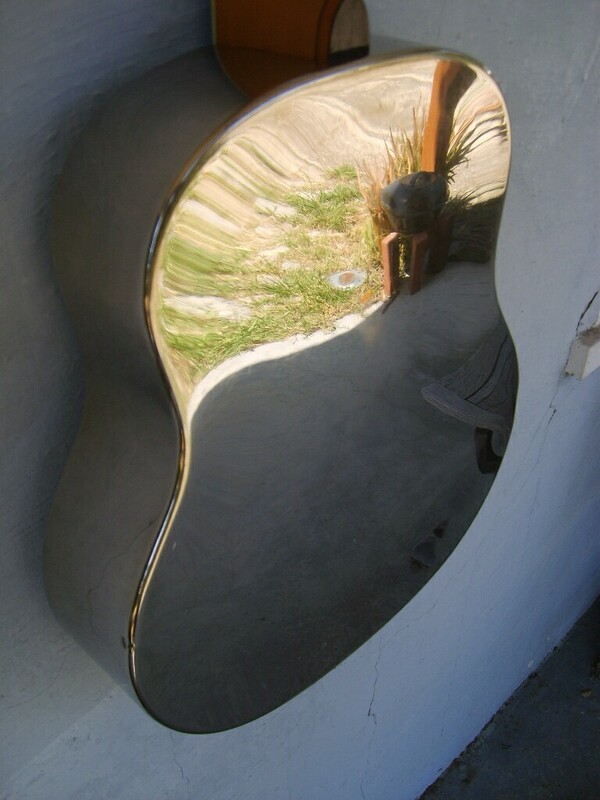 Please click on any image to see a larger version of that picture. Just in, newly arrived, a 1934 M- 62 Dobro fiddle edge. 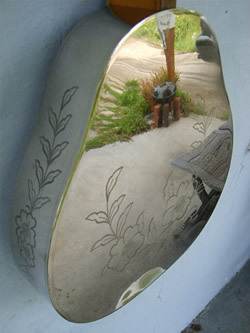 Call me, Marc at 1-805-481-8532 for more details, and please take a look at the pictures below. 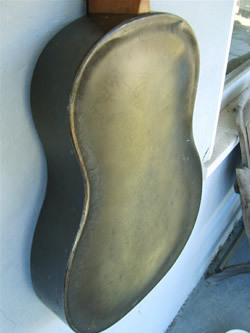 Newly arrived, a 1934 M-62 Dobro fiddle edge. 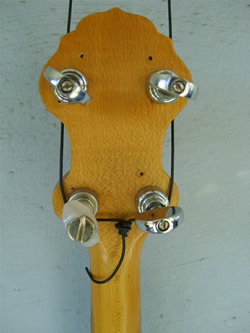 Guitar (style 0, single cone, Sq Neck). Serial # B900 Sold. 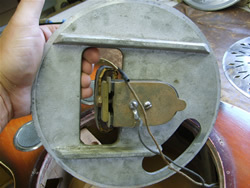 Guitar (style 0, single cone, Round Neck, with Collegian coverplate.) Sold. 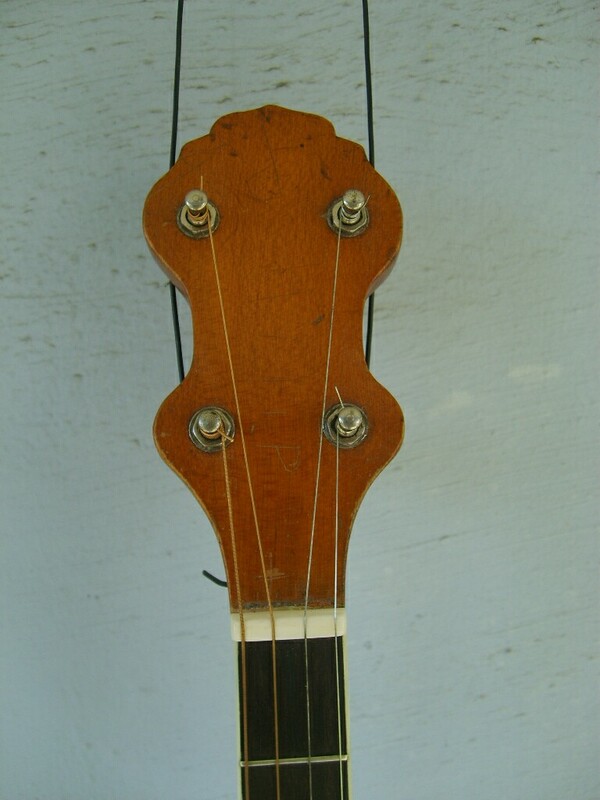 Guitar, (fiddle edge, Sq Neck). Serial # None. Sold. Mandolin (style 1, Silvo, electric). 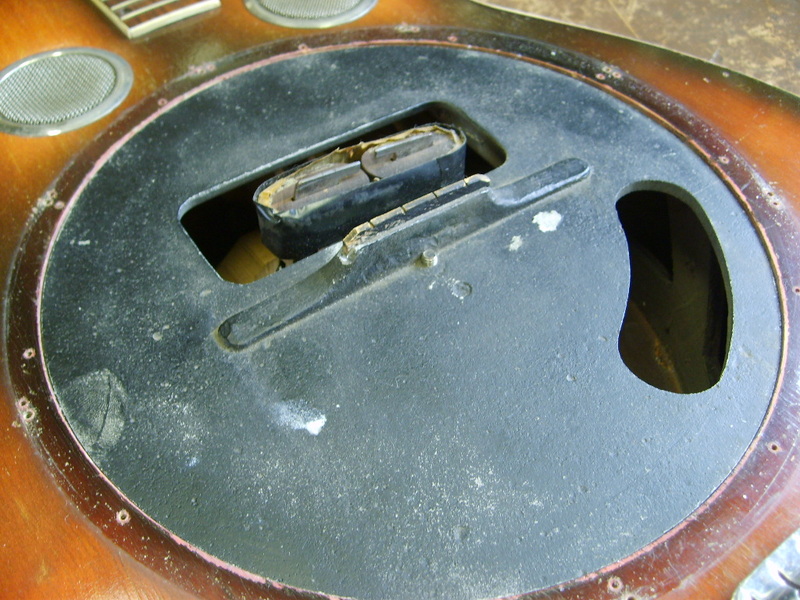 Serial # None Sold. 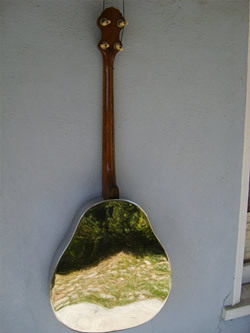 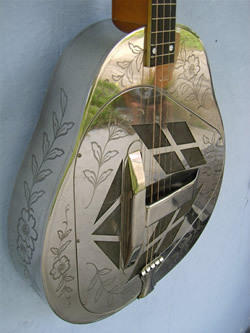 Mandolin (Rosita, wood body). 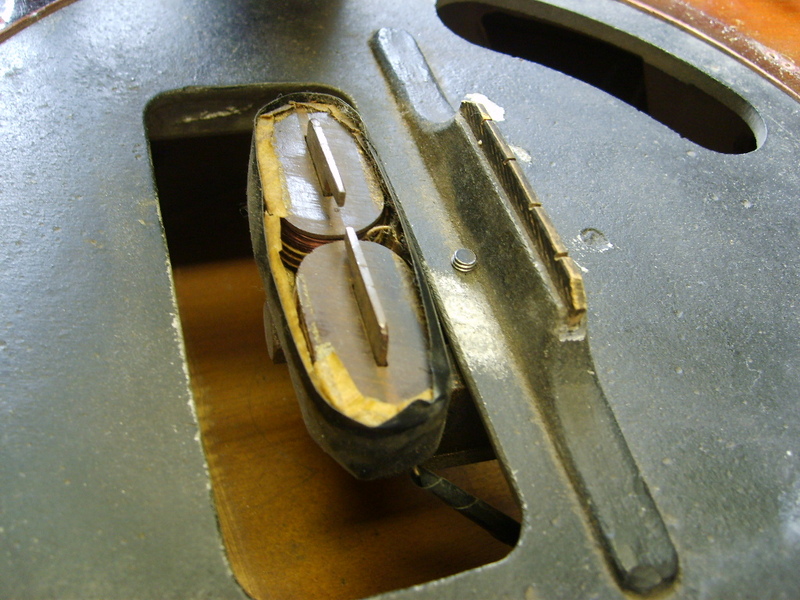 Serial # None Sold. 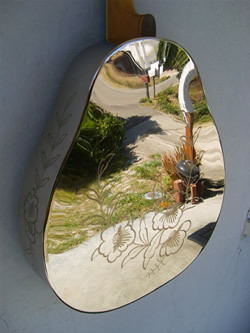 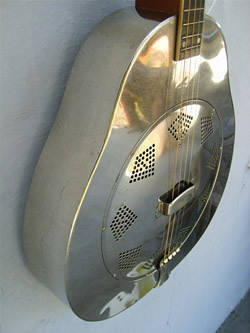 Guitar (style 1, Don, round neck). Serial # X48 Sold. 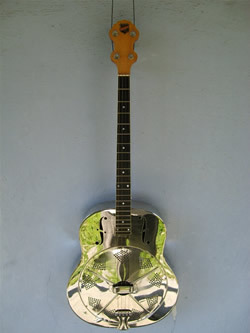 Guitar (style 1, Don, square neck). Serial # X70 Sold. 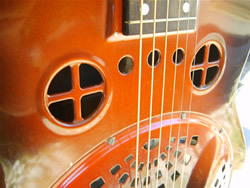 Guitar (style 2, Don, round neck). Serial # X78 Sold. 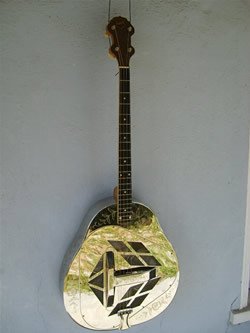 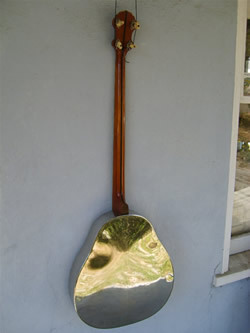 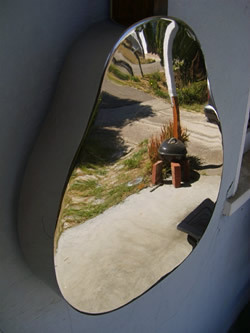 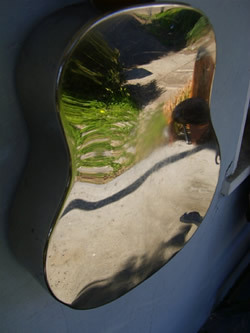 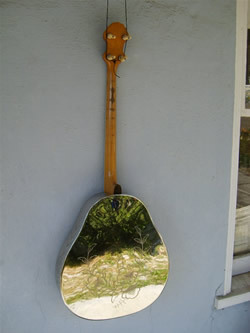 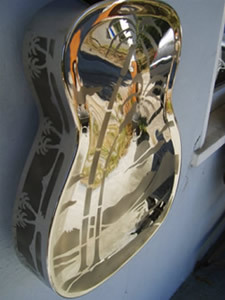 Tenor guitar (style 1, single cone). 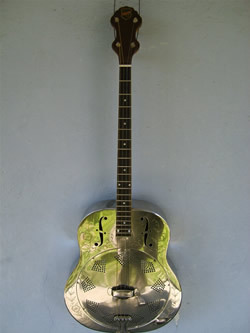 Serial # 1045 Sold. 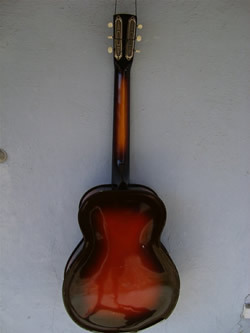 Tenor guitar (Triolian, single cone). 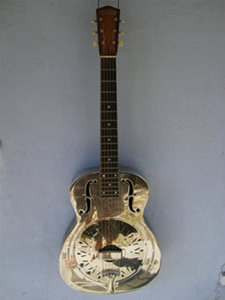 Serial # 2067P Sold. 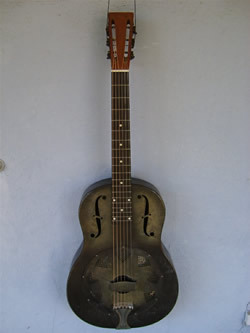 Duolian 12 fret Guitar, 1930. Sold. 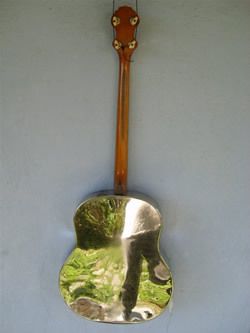 Guitar, (fiddle edge, AluLite, Sq Neck). 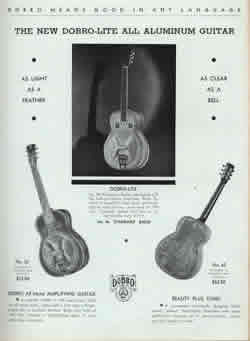 Serial # None Sold. 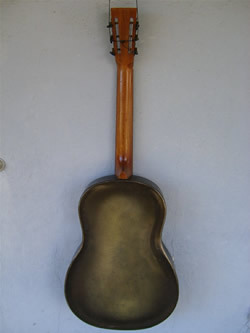 Guitar (Triolian, single cone). Serial # 2356W/S649 Sold. Tenor guitar (style 2, tri-cone). Back to the list of instruments. 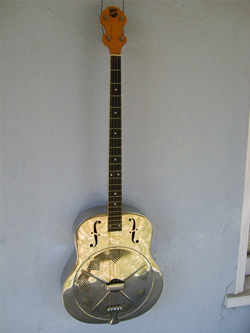 Tenor guitar (style 1, tri-cone). 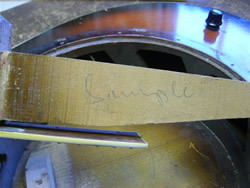 Early non spiral cones, the thinnest I have ever seen! Sounds great. 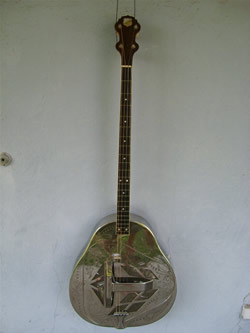 Tenor guitar (Wood body, electric). The only Electric tenor I have ever seen. 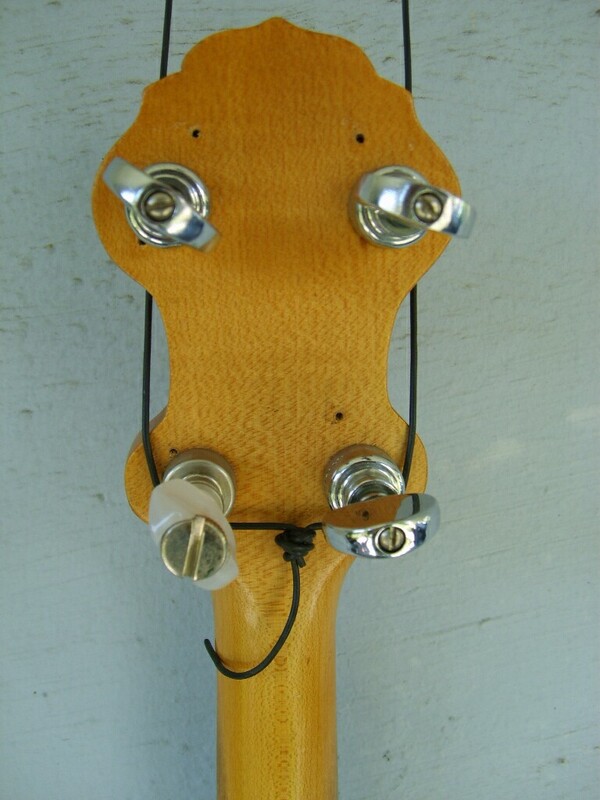 Clearly marked 'sample' on the neck stick and on the body. 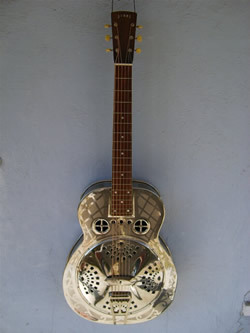 The pick up is similar to that found on the electric style 3 Don in the Notecannons collection. Non fitted old hard case. 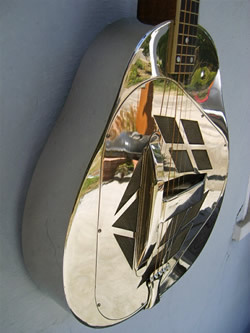 Plectrum guitar (style 1, single cone). 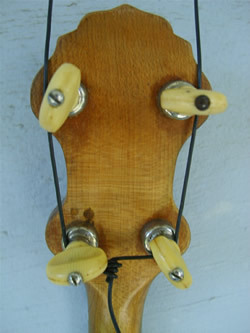 Tenor guitar (style 2, single cone). 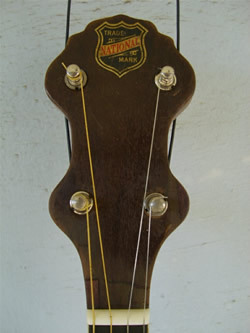 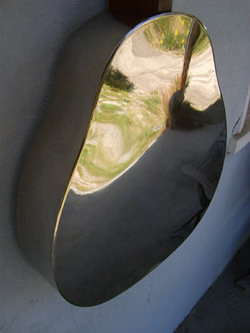 Mandolin (style 1, single cone). 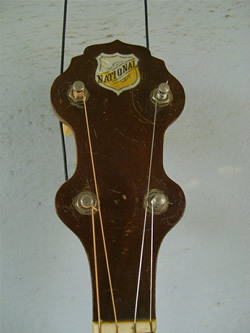 Guitar (Style 0, square neck). 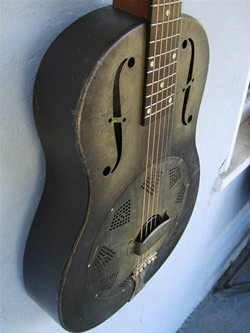 Guitar (1934 Style 0, with Collegian coverplate). 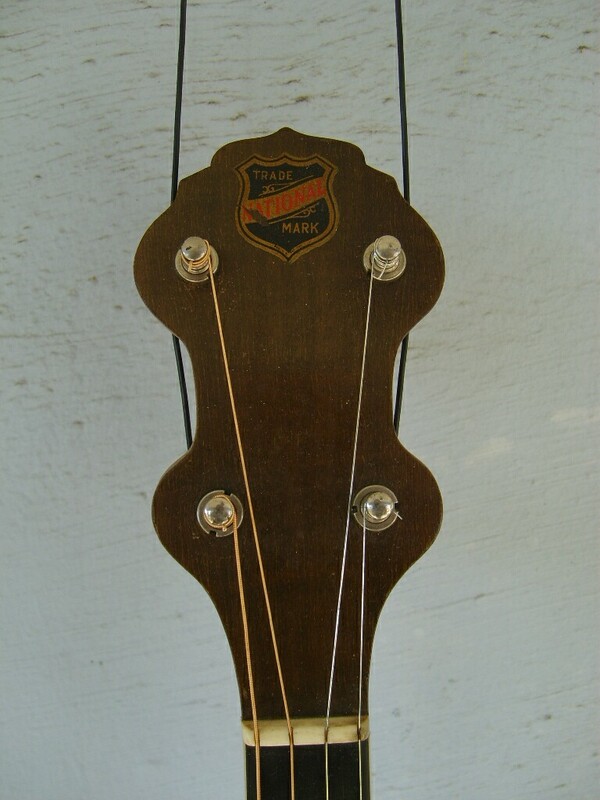 This instrument is from Marc's collection, it has an old headstock repair and new tuners, and at some point has had a Collegain coverplate added. 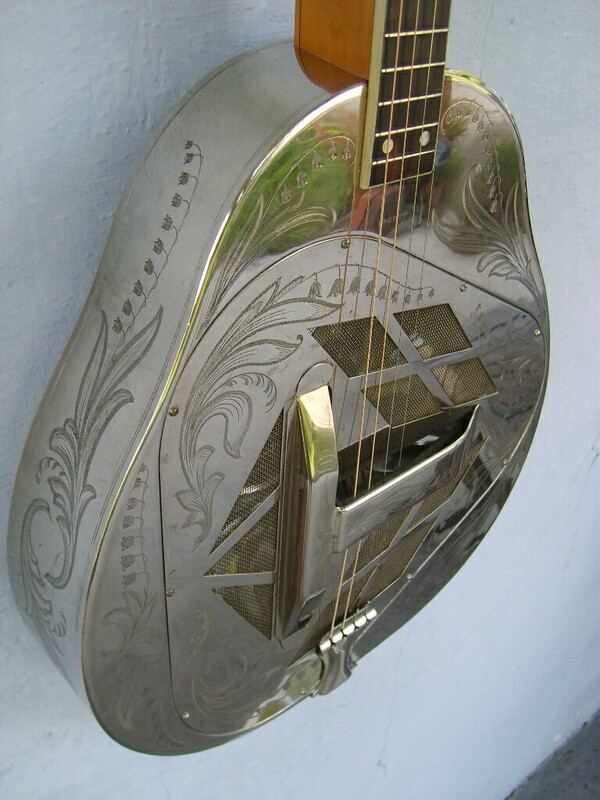 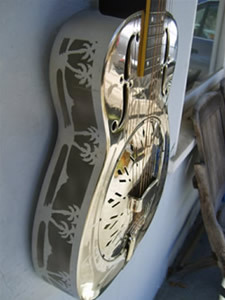 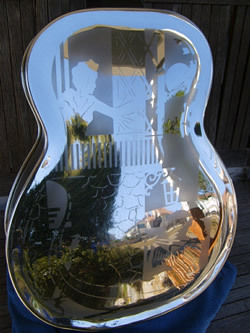 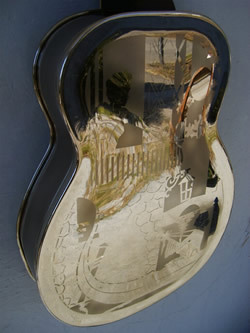 Dobro guitar (Fiddle edge, Romeo and Juliet scene on back). 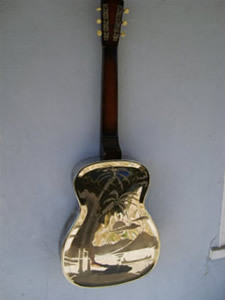 Hawaiian neck, the pictures don't do it justice. 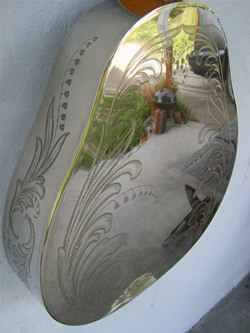 In all our catalogues I've never seen this particular sandblasted patern, it must be really rare! 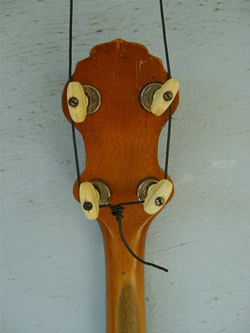 Mandolin (style 2, single cone). 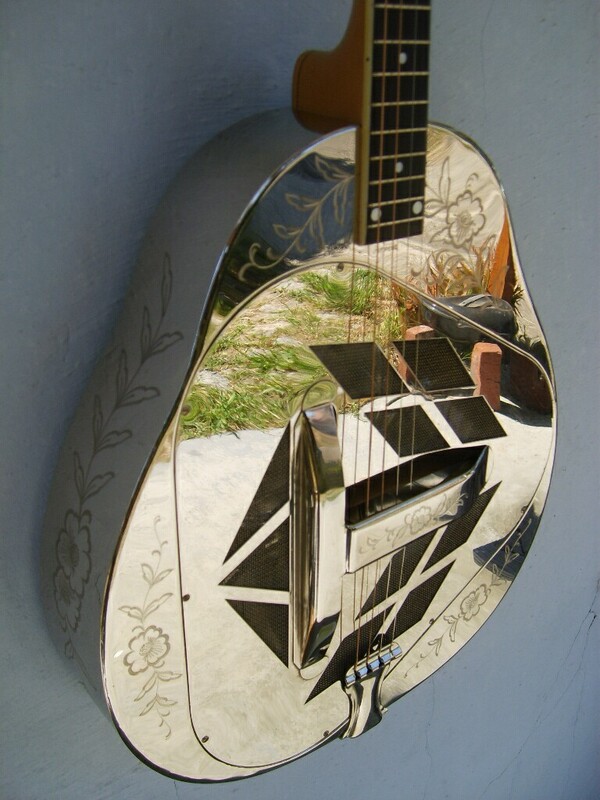 Rare and shiney! 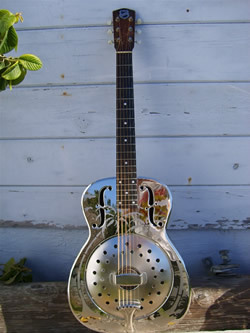 A real beauty. As clean as can be, could have been bought new from the factory last week! 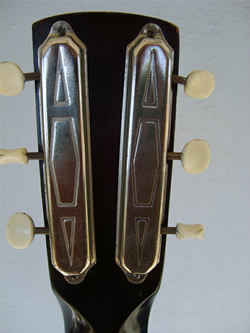 Mandolin (Triolian, white, single cone). 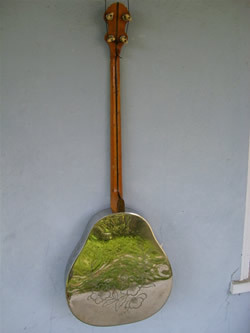 Mandolin (Triolian, polychrome, single cone). 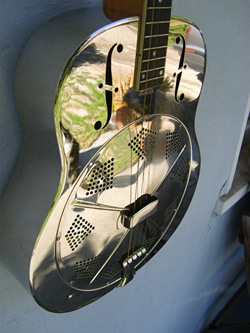 Mandolin (style 1, Silvo, electric). 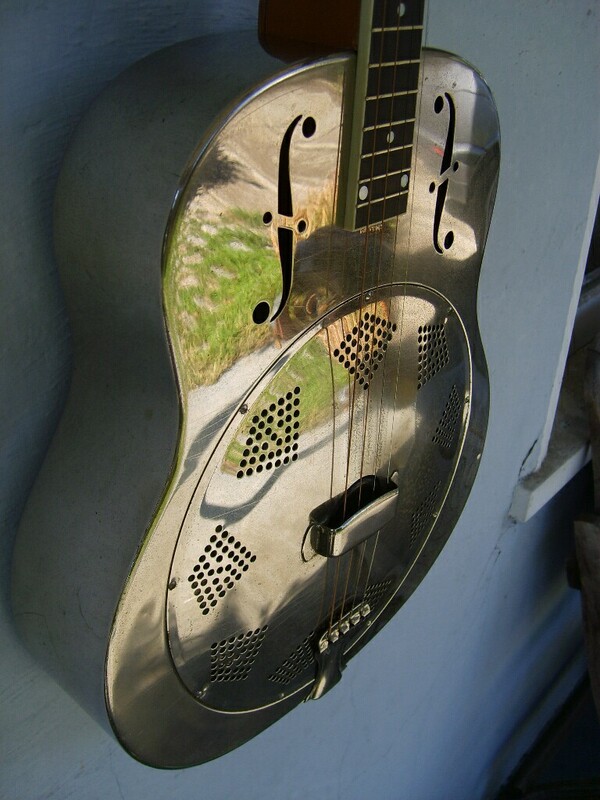 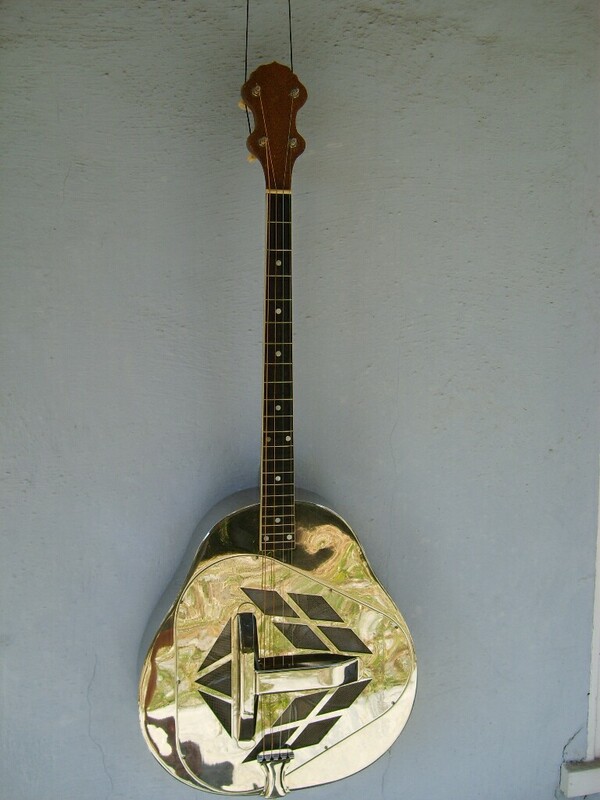 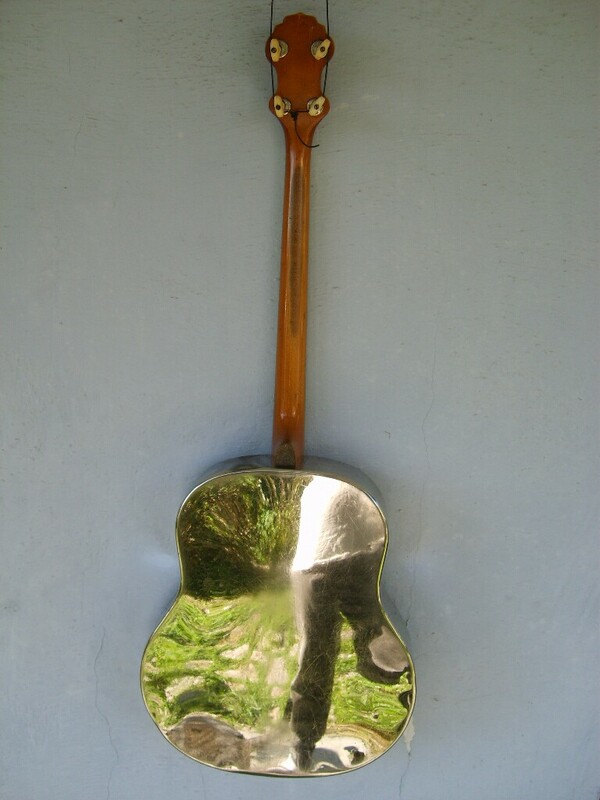 Rare wooden bodied resonator mandolin. Plectrum Guitar (style 2, tri-cone). Very rare, transitional model, single cone in a pearshaped tricone style body! 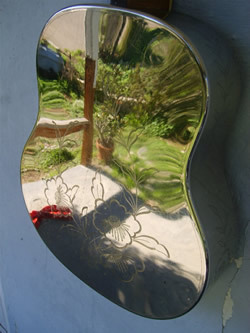 Guitar (style 1, Don, round neck). 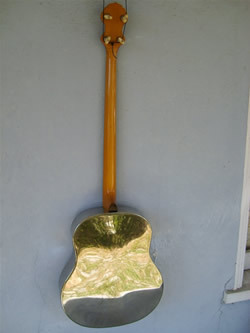 Guitar (style 1, Don, square neck). 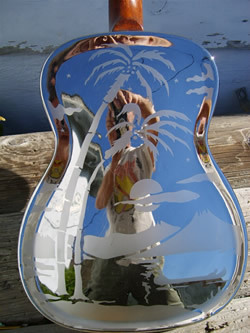 Guitar (style 2, Don, round neck). Tenor guitar (style 1, single cone). 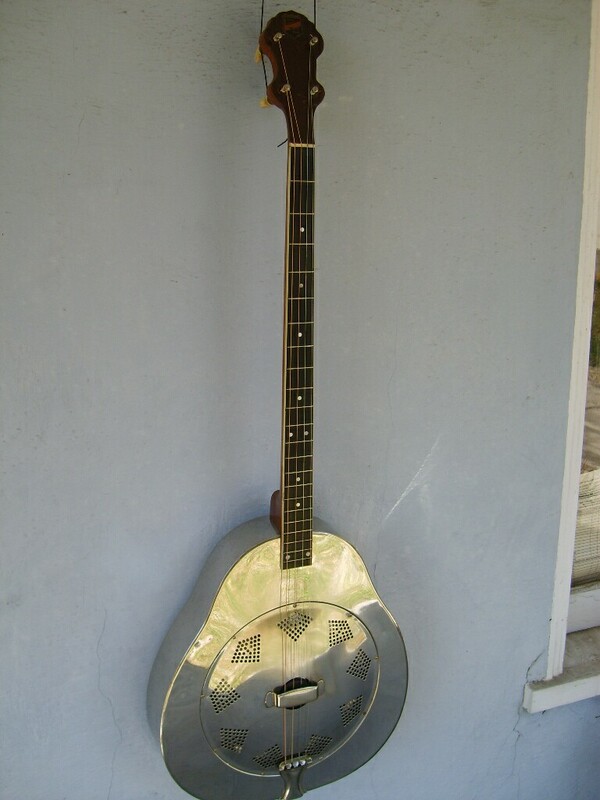 Apart from replaced tuners a really clean example of the tenor guitar. 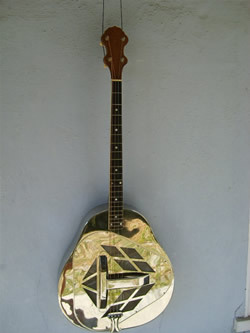 Plectrum Guitar (style 3, tri-cone). 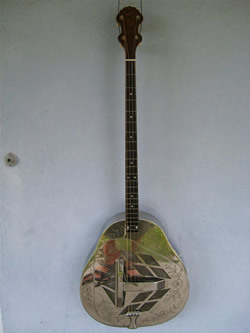 Ready to go..For sale 'As is'. 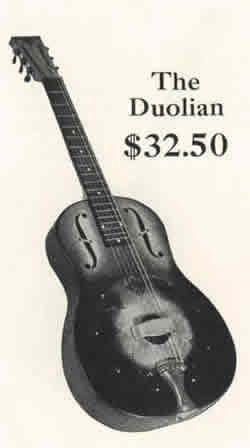 Duolian 12 fret Guitar, 1930. 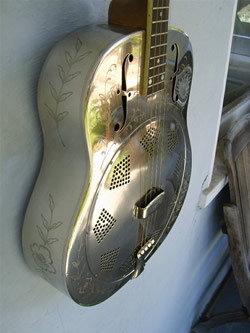 From the golden years of the Duolian, this is from Marc's collection. 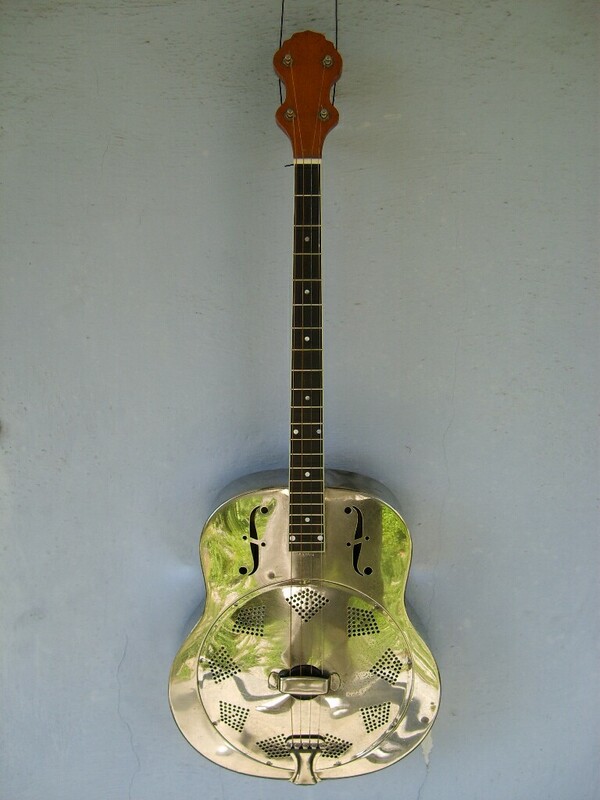 Fitted with a new fingerboard, and with it's paint substantially intact, this 12 fretter is loud and perfect for player and/or collector. 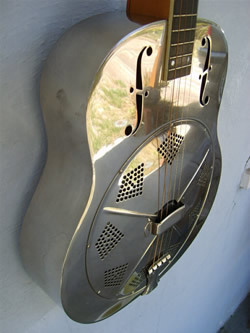 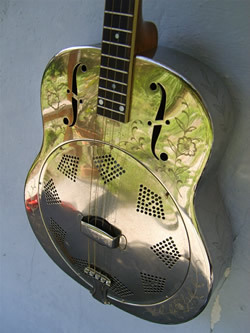 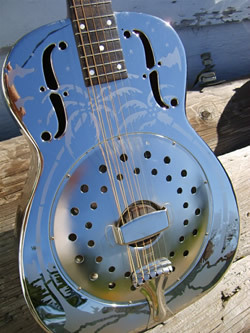 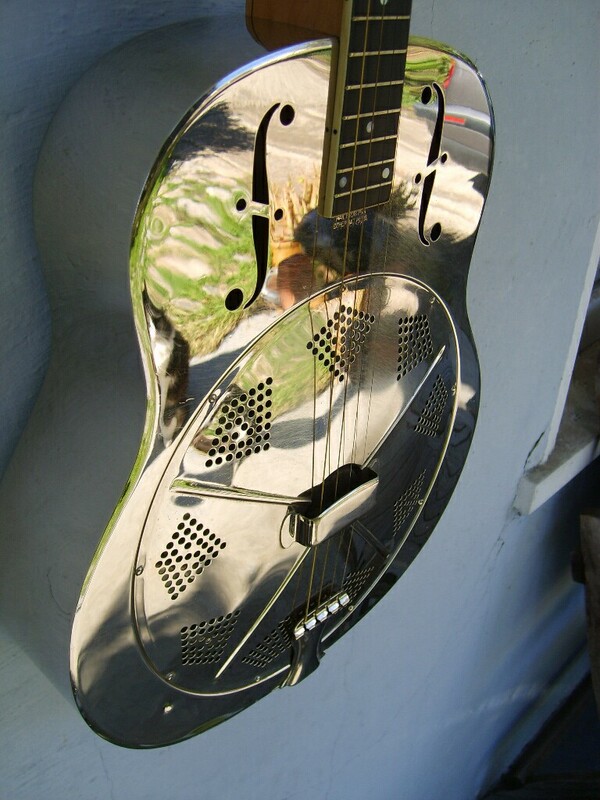 Dobro Guitar, 'Dobro-lite' (Fiddle edge, Round Neck). 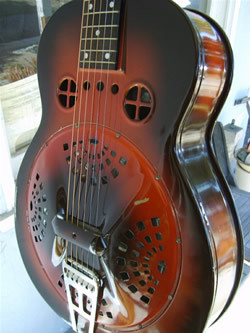 An extraordinarily rare Dobro, especially in this condition. The few of these that we have seen in the past have lost most of their paint, but this one has 99% of it's paint cover intact. 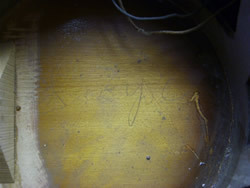 There is a small dent in the bass bout, and a pick scratch on the coverplate, see pics, but apart from that it is as clean as you can hope for. 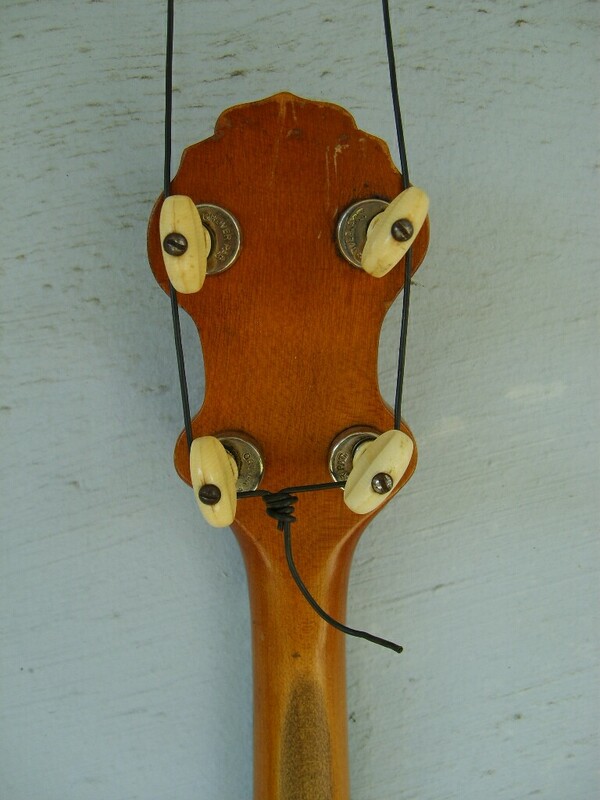 Dobros don't normally have a neck stick that travels under the cone, but the fiddle edge instruments like this one did, they had a shallower cone well and a cone with lugs inside the cone to allow the cone to sit higher. With 2 serial numbers (S649 on the body and 2356W on the headstock), this is almost certainly a style O body with some sort of factory blemish that was then finished with paint as a Triolian. 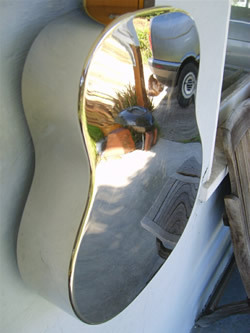 Paint is 99.9% intact, and it is as clean as I've ever seen. 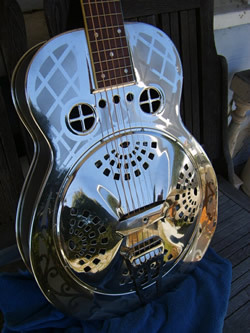 Could have left the factory last week!